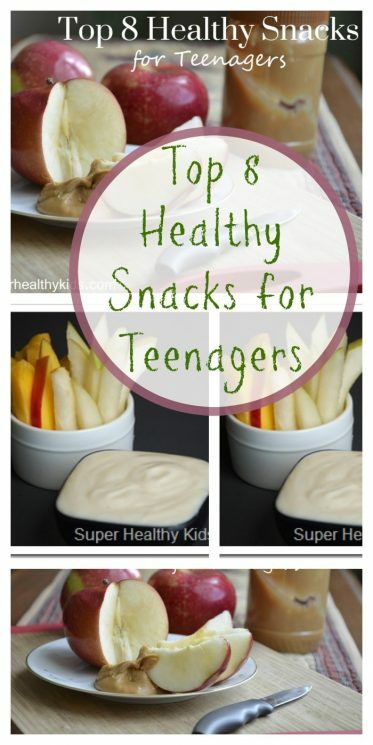 Healthy snacks for your growing teenagers! Teens can be a tough group of people to please, especially if they’re your own! One thing is for sure, if you have a growing teenager, plan to have your grocery bill skyrocket. They can eat a lot of food. On the opposite extreme, you may have a small-ish teen who doesn’t eat much at all. Whether they have hit a growth spurt, or their appetites is diminished, they can both eat the same healthy snacks! We’ve always seen snacking as a way to meet nutrient gaps from the day. If the day is half gone and no protein has been consumed, I always suggest a snack higher in protein. If no fruits or veggies have been eaten, then I suggest one of those! Soft pretzels and hummus. The recipe I posted the other day was perfect for my 13 year old. He came home from school, ate the snack and literally didn’t come back to the kitchen until dinner. Baked corn chips with bean dip. We love the bean dip that has black eyed peas, avocado, and tomatoes! While my kids will literally eat it by the spoonful, adding some pita crisps or chips makes it a little more filling. Fruit and a yogurt based dip! 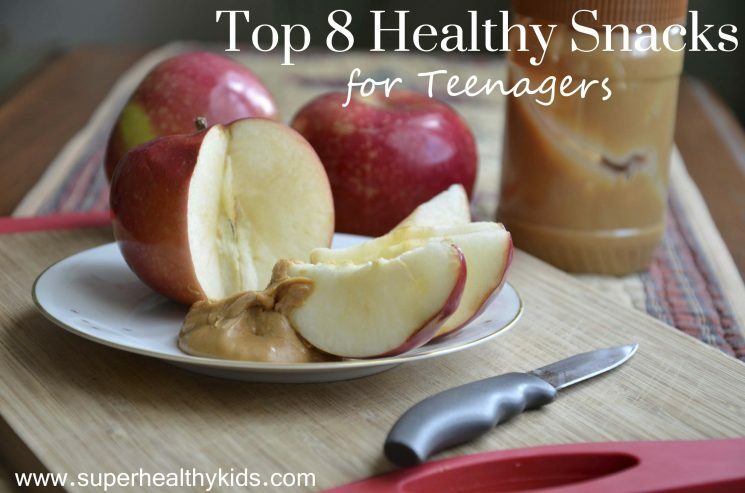 What’s your teenagers go-to afternoon snack? This is a great post for me right now. My 13 year old son comes home from school and eats a sandwich. He swims for over an hour everyday (swim team) and I have needed some new ideas on what to feed him. I am going to boil some eggs and put cheese sticks on my grocery list. Do you put anything on the popcorn/nut/fruit mixture to help it stick together? I just found your site when i googled healthy snacks for kid blogs. this is great i help with my daughters schools healthy snack program…and i am in there almost every day helping with this ..picking up food at the grocery store and preparing it..and i am always trying to find somthing new and exciting for the kids to try….thank you soo much for all the new ideas…Eggplant dip…is the next thing i am going to prepare. A peanut butter sandwich on WW bread and an apple. The fruit and yogurt dip seems so amazingly good. I will replace our old popcorn with these. wow! All these are regulars on our snack/ mini meal list! except the pretzels/hummus. Ill add this! These will all work for breakfast too! I get a large bag of frozen strawberries, grab a handful and deffrost for a minute, cut up with scissors, add greek yogurt or cottage cheese & splenda. YUM kids love it. Most days, my daughter will cut wraps into strips, spray with some olive oil, sprinkle some herbs and cheese, then bake them in the toaster ovenuntil it turns crispy. Then dip into roasted broccoli-and-cauliflower hummus. (I make a tub of it weekly.) She says she’s “allergic” to vegetables, but she ploughs through the hummus like there’s no tomorrow! PLease tell me nmore about this roasted broccoli and cauliflower hummus.. I love it!! Thanks for sharing! I think I’ll make these today and post about it, if that’s OK!!?? Would love to get the recipe for the roasted broccoli and cauliflower hummus if possible! Amy… sure, of course!! Mums like us can always use a little help 🙂 You yourself has helped so many mothers!! Wow I need these great ideas for my 13 and 19 year old. 13 year old is dancing 5-7 days a week. It is a challenge to find good food she will eat! I am 13 years old and this really helped, I am skinny but I want to start eating healthy… My afternoon go-to snack is leftovers from the night before but I’m gonna start eating like this! this really helps! I’m 13 and am interested in slimming down a bit, when I was younger I had a bit of a junk food phase and am regretting it now. I’m changing the past and am eating healthier and working out daily so these snacks are great, thank you! I would love to get the recipe for the roasted Broccoli and Cauliflower hummus! Popcorn is among my sons favourite snacks, but sometimes I think he’s really overdoing it. I was looking for some alternatives, thanks for the article. cheers. What’s up, I wish for to subscribe for this weblog to take hottest updates, so where can i do it please help out. Usually I do not learn post on blogs, but I wish to say that this write-up very pressured me to take a look at and do it! Great post! Make sure you floss after eating the popcorn though! My teen has braces so the popcorn alone is no fun. Add dried fruit and nuts and wham, a call to the orthodontist. Or, a very long time spent cleaning the braces. My 13 year old eats lunch at school at 11:20 so when he gets home at 4, he is STARVING. If left to eat as he pleases, it’s cereal and any non-nutritional thing he can find. I have been making him “mini meals”, chicken sandwich, yogurt parfaits, hamburgers, left-overs from the night before, tacos, protein powder pancakes (Kodiac), eggs, etc. If he has sports, he will want to eat at 7:30 so I have to have dinner left overs or he goes for the cereal again. It is challenging if we eat early (5:30), as he may not be that hungry then. What should healthy kids eat for breakfast and dinner I try to sometimes ask my mom to get me something sometimes but idk I get to ask her for ? Hi Neveah! Any meal with a balance of whole grains, fruits/veggies, and protein is healthy for your kids. I hope this helps. Raising healthy kids can be a challenge, but keep up the good work!